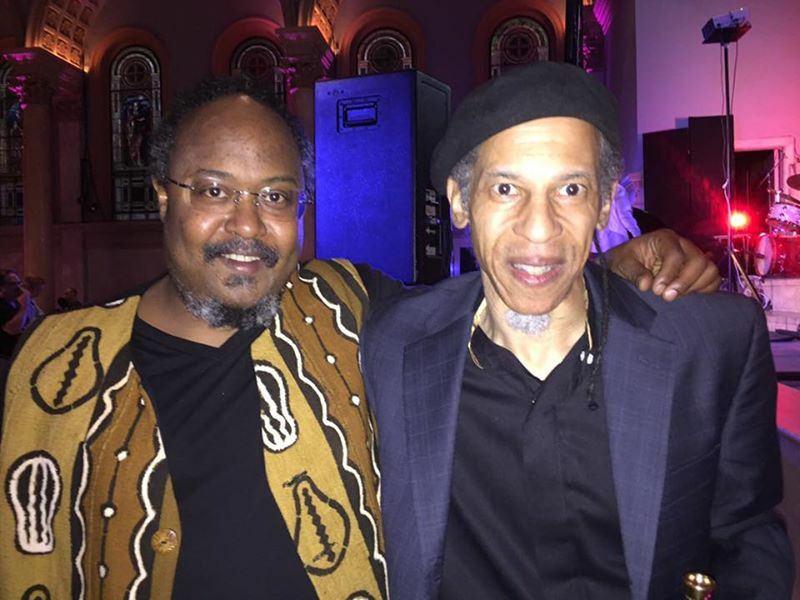 Nathan Breedlove and the Last of the Tribe – featuring Booker T Williams, Gary Hammon, Michael Barnett and Jamael Nance. Live at the Royal Room Sept 27th. 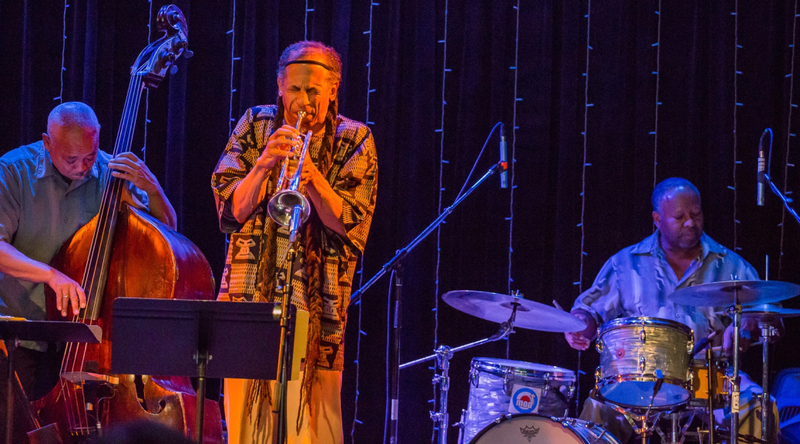 The nu Trio at the Seattle Art Museum on Sept 13th..sponsored by Earshot Jazz and KNKX. 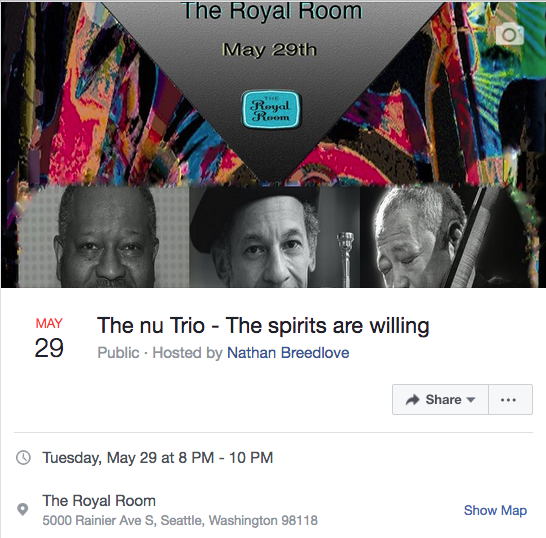 The Nu Trio plays a show at the Royal Room in Seattle, Washington, on Aug. 4, 2018. 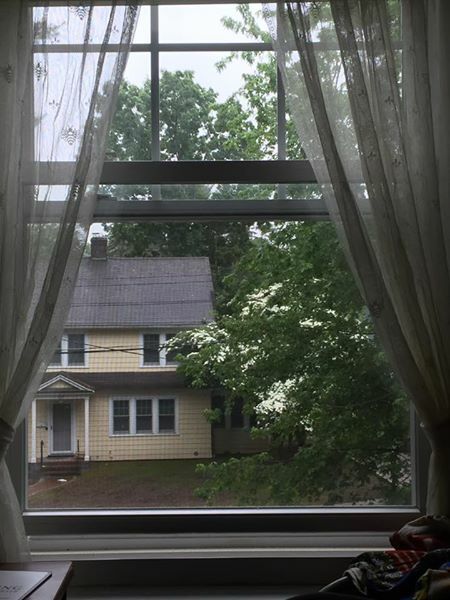 (Photo: Carolyn Bick). Nathan’s personal page at the Grammy site. Nov. 17, 2017. 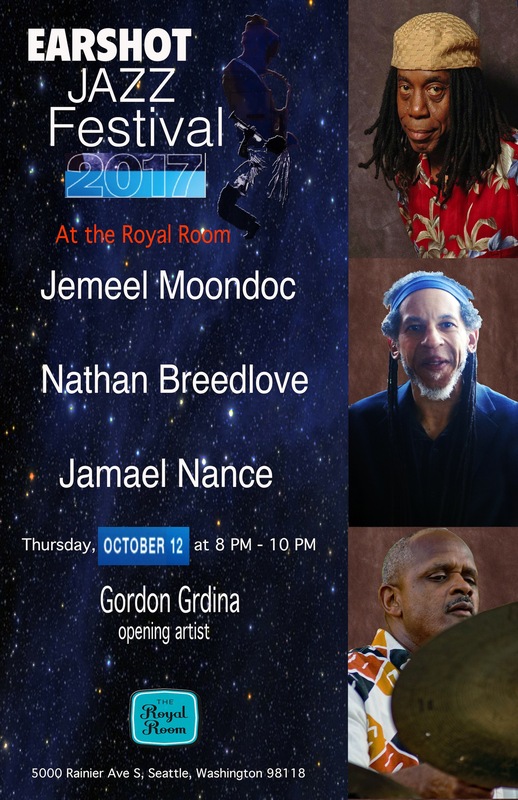 Nathan, Jamael Nance and Jemeel Moondoc, live at the Royal Room for the Earshot Jazz Festival on Oct 12th. New York lower east side comes to Seattle. The concert was amazing, filled with cosmic energy and creative, original improvisation at the highest level. Bravo Seattle! 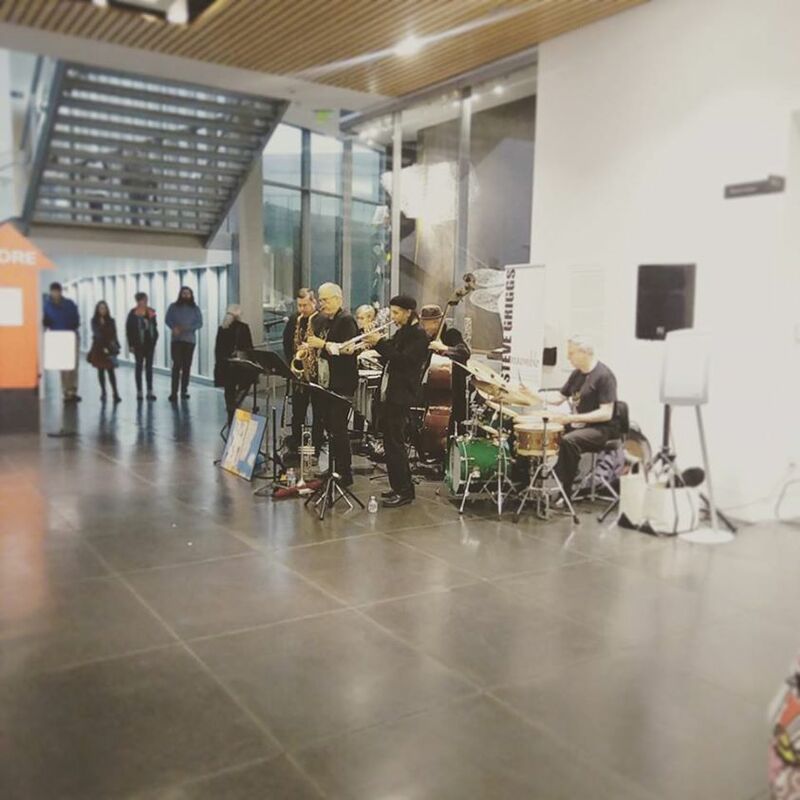 Today’s concert at the Tacoma Art Museum was absolutely marvelous. Bravo to the Tacoma audience..well attended and folks paid very close attention..beautiful..The band under the direction of Steve Griggs was swinging! Steve, Jay Thomas, Susan Pascal, Phil Sparks, Christian Milo Peterson and yours truly..outstanding. 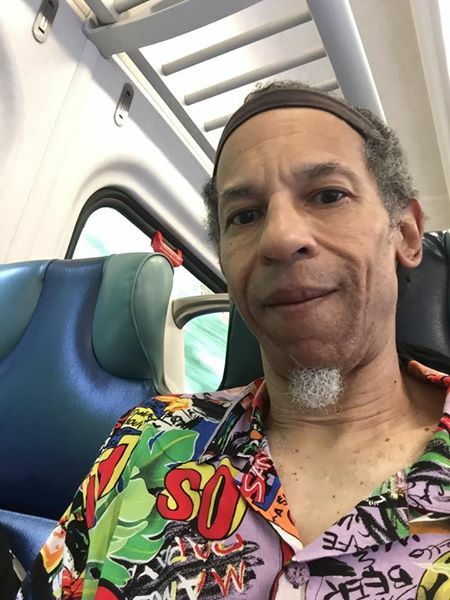 The story Steve is relating refers to Charlie Parker’s first tour down south, in a town where black folks were not supposed to be on the streets after dark(black codes/i.e. the law). Bird, Diz and the others were staying at a private home, hanging out on the porch when the police showed up to harass, harangue and denigrate the worlds greatest artist’s..only in America..love..love. 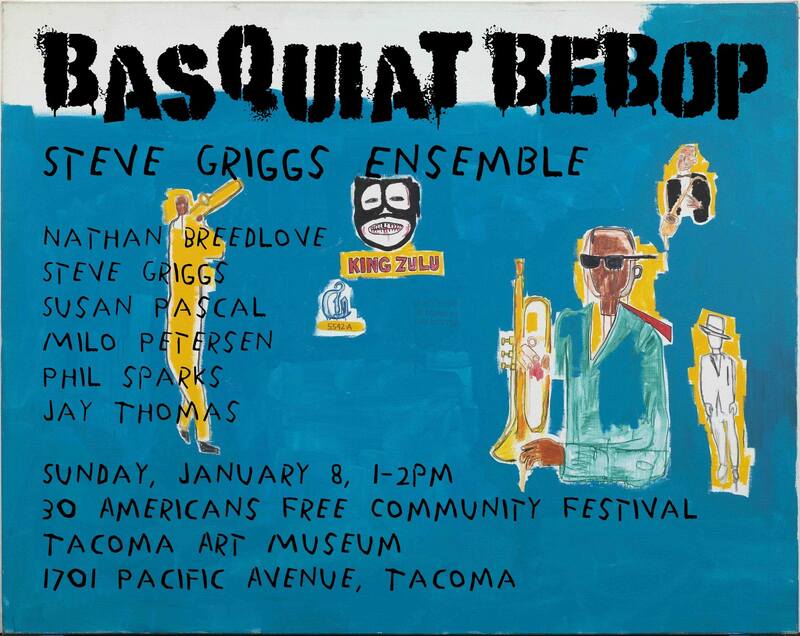 Basqiat Bebop – Steve Griggs Ensemble with Nathan Breedlove, Steve Griggs, Jay Thomas, Susan Pascal, Phil Sparks, and Christian Milo Peterson. Click on picture for the story. 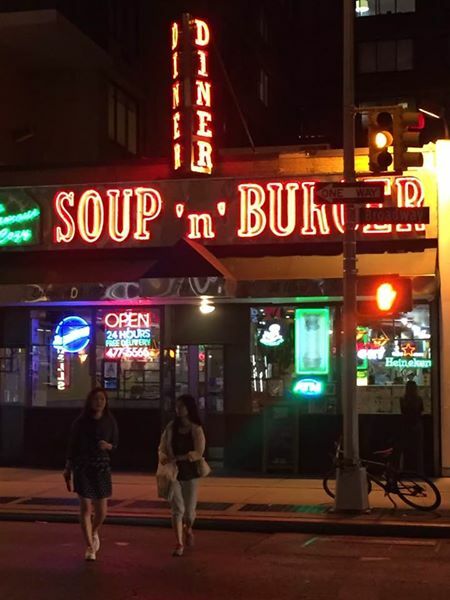 Nathan Breedlove’s 2016 Adventures in NYC. Wedsnesday June 22nd 2016 – on the plane, back to Seattle from NYC. 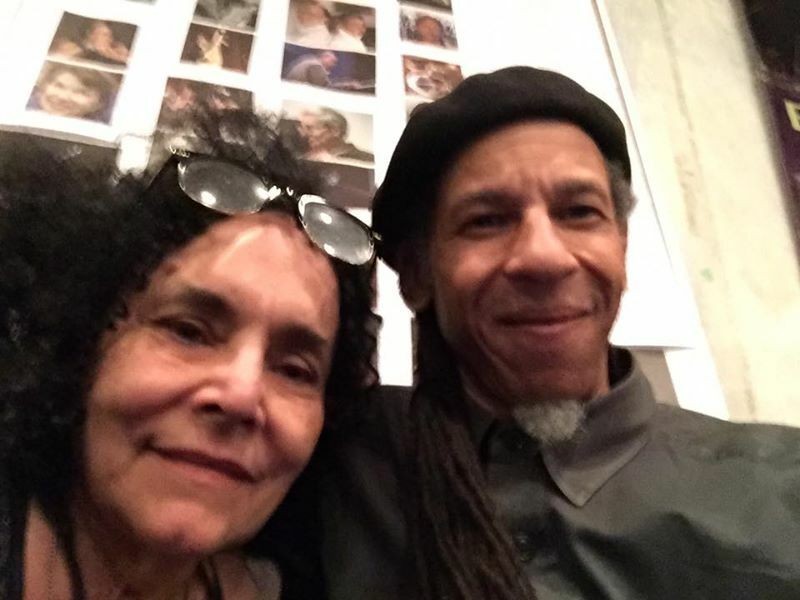 Nathan with his close and dear friend/sister Terri Kerni..Art and Evelyn Blakey lives!! That is how these two became family. Thursday, June 12, 2014 at 11:50pm PDT – on the LIRR. and really look forward to our next dinner. evenings! 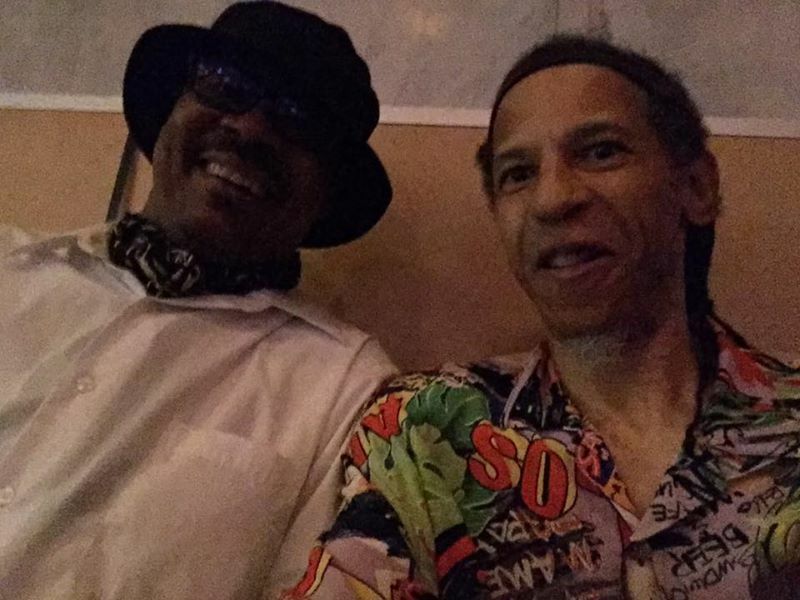 Michael Whitcomb and I send you much love. 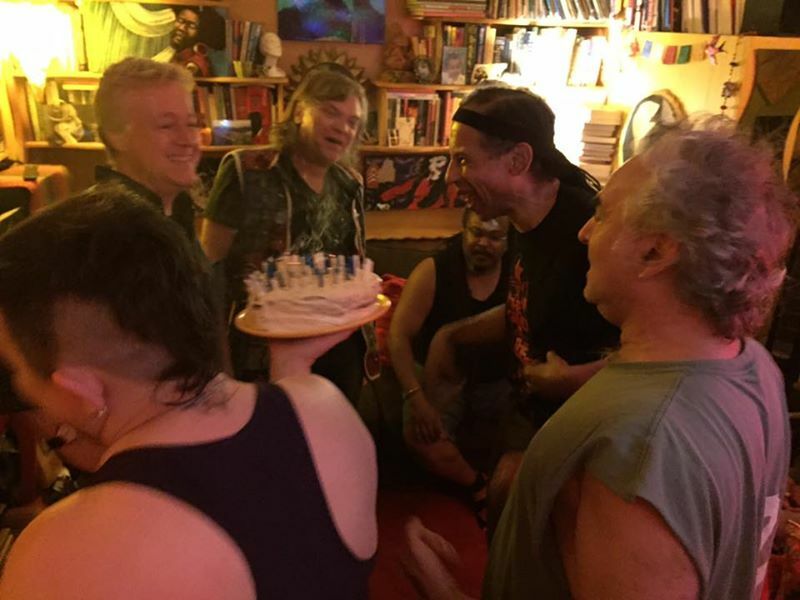 Friday, June 17th – The birthday cake remnants. >Thelma White – Wow! That is really artistic!! >Glen Page – 60 candles will do that to a cake! Happy BD! Ted Sharpe – All right bro, it’s time to get the number candles for the next one! You fixin to burn the neighborhood down! ? Nathan’s party at Gabriela’s. 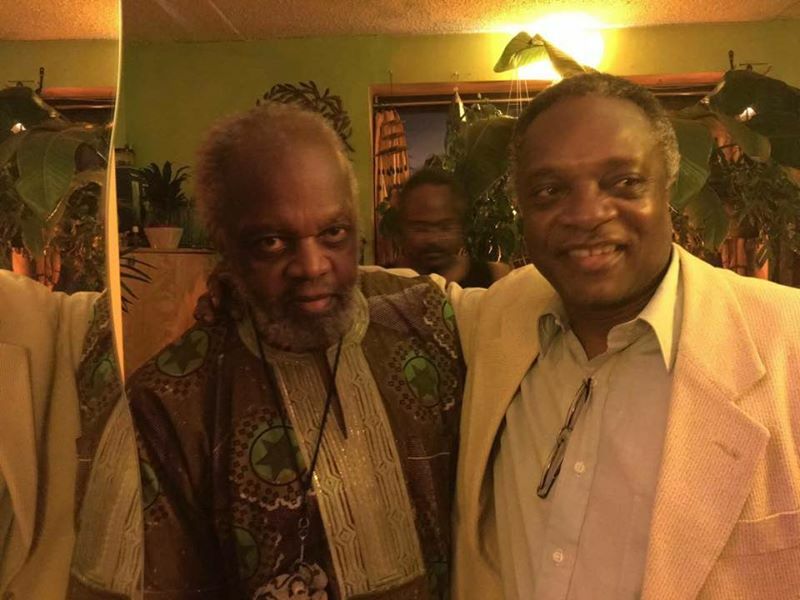 Henry Grimes, James Zollar and Ras Moshe Burnett in the background. 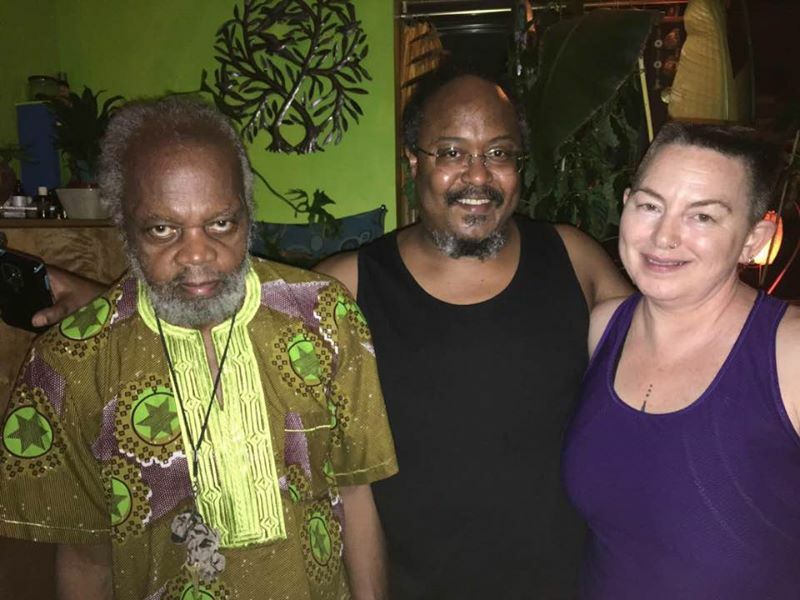 Henry Grimes, Ras Moshe Burnett and Gabriela Sonam. in 1985. 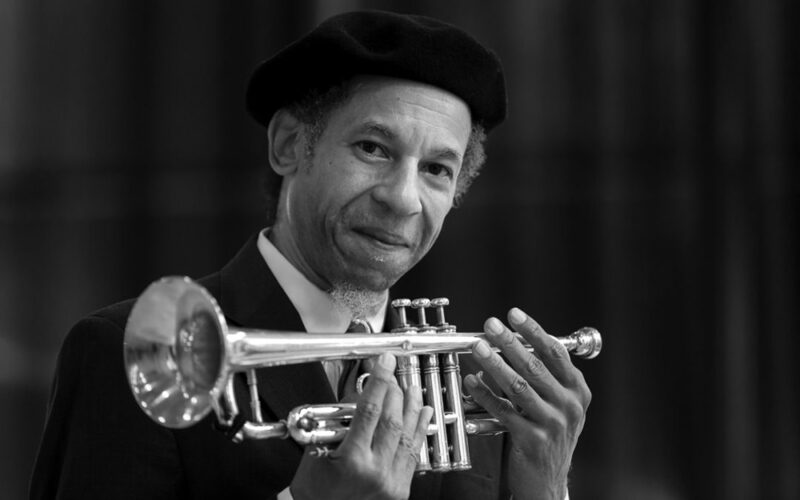 James is the longtime trumpeter for the Duke Ellington band for decades, the Basie Band..
James Zollar and his wife Nabuko Jazz. Nathan Breedlove and Clark Gayton. Old bandmates and closest of friends. 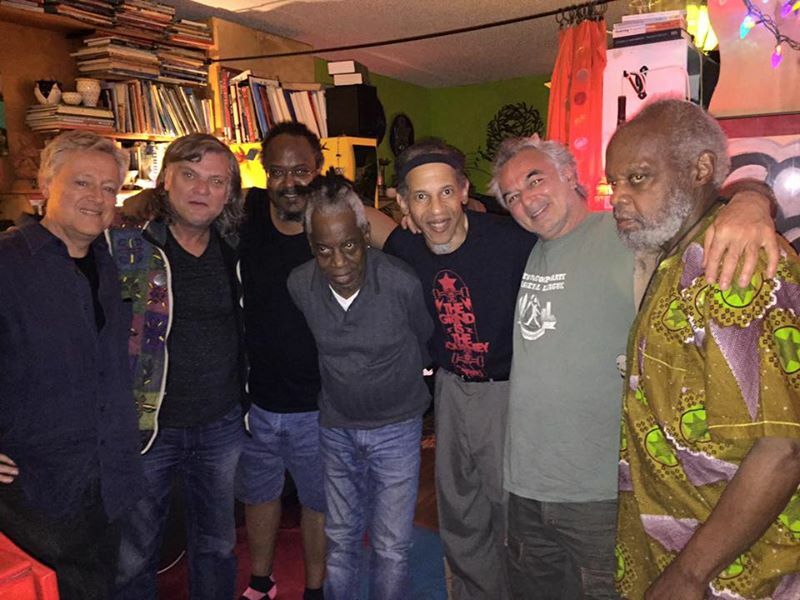 Rick MacLaine, Charles Xavier, Ras Moshe Burnett, Jemeel Moondoc, Nathan, Avram Fefer and Henry Grimes. 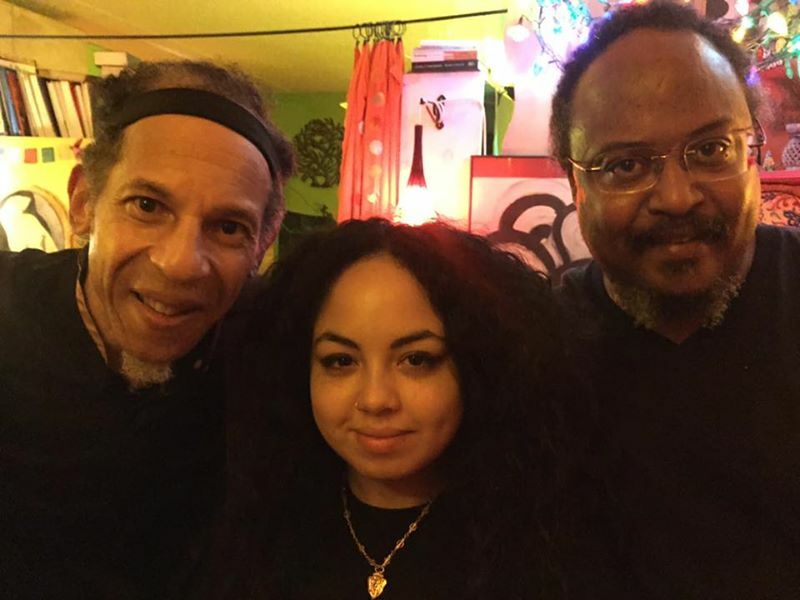 Nathan with niece Arkah and Ras Moshe Burnett – saxophonist extraordinaire and keeper of the flame. >Gabriela Sonam – 3 of my favorite people on planet earth!! 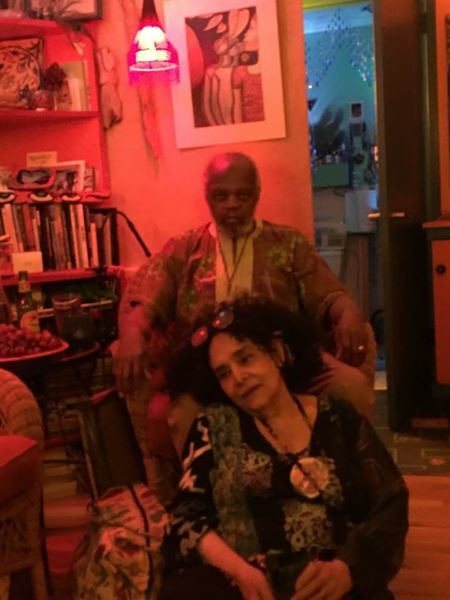 Henry Grimes and Gabriela Sonam. Nathan and Doper Jones. Family..
been close friends for over twenty years. 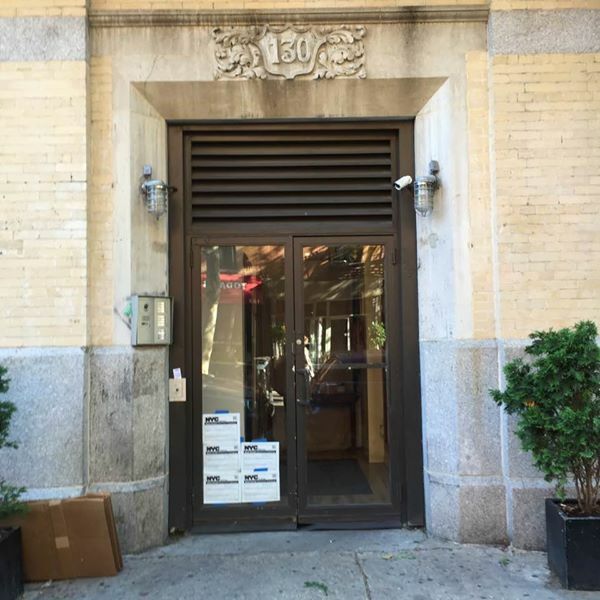 where Nathan stays when he is in New York. Nathan with Avram Fefer after playing together and hanging out in the park. very first trip to NYC in the mid-eighties. Right next to the Blue Note. to Nathan back in the early nineties. 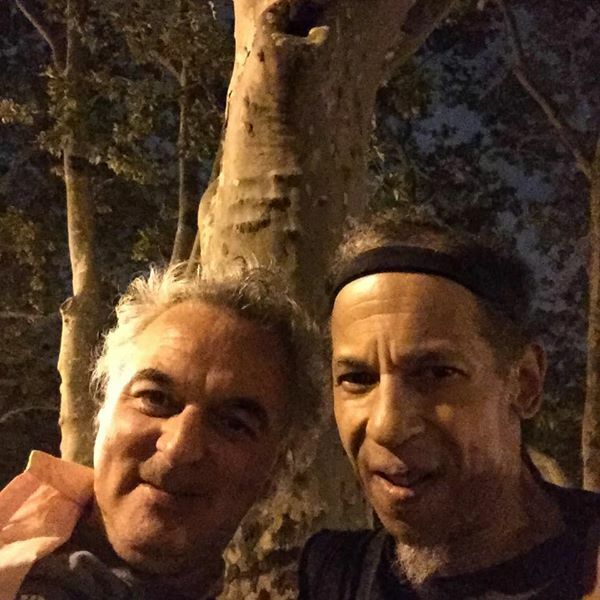 >Charlie Dahan – Not a fan. >Charles Tomaras – Is Ray’s still a thing or has it’s time past? 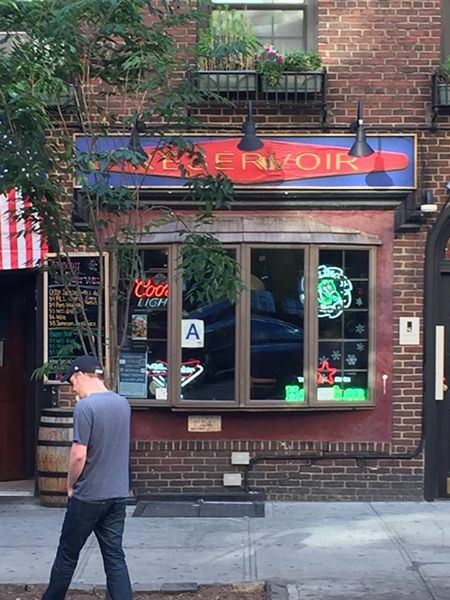 I must say I haven’t had a slice there in years…..
>Richard Hilms – Ray’s is still going in N.Y.C. Walt. don’t know this place. >Nathan Breedlove – it wasn’t too bad, professor Munch..? cheese and I never went back. >Charles Tomaras – So I’m guessing you don’t like Dominos. 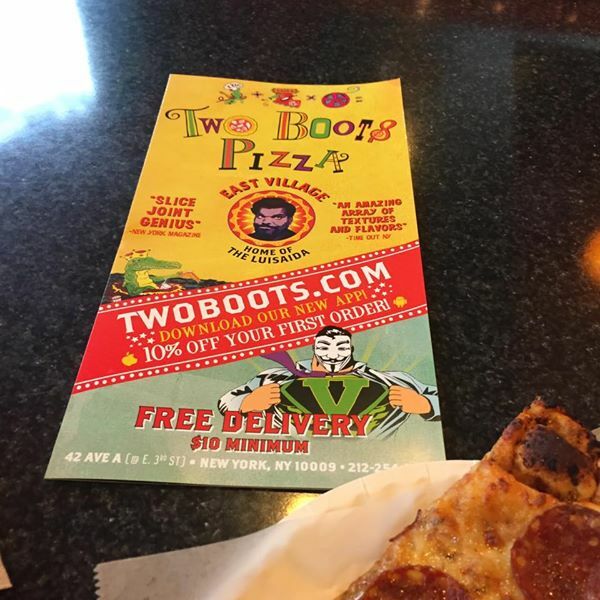 >Paul Rauch – I believe there is a 2 boots pizza joint in Bridgeport CT as well, that has live jazz. warm-up. 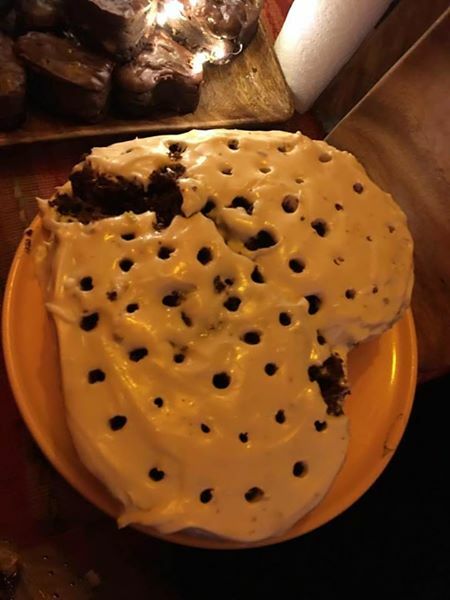 No can do anymore. 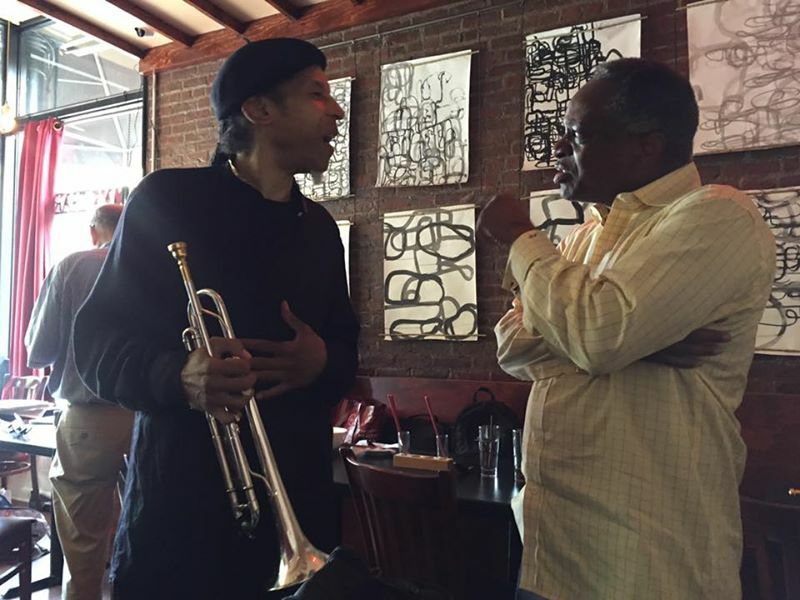 Nathan and Antoine Drye – a young trumpeter from New Orleans. 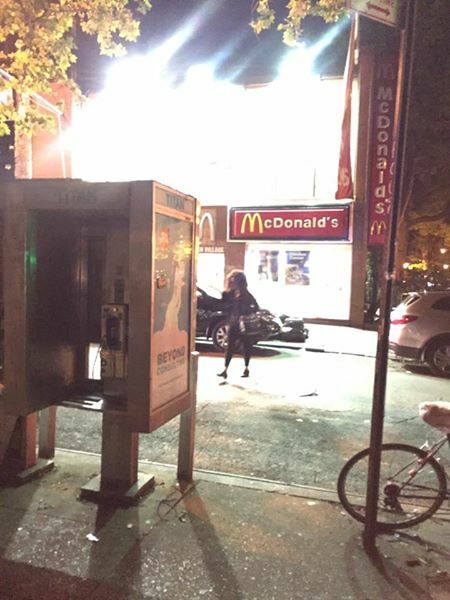 Nathan’s old hangout spot. 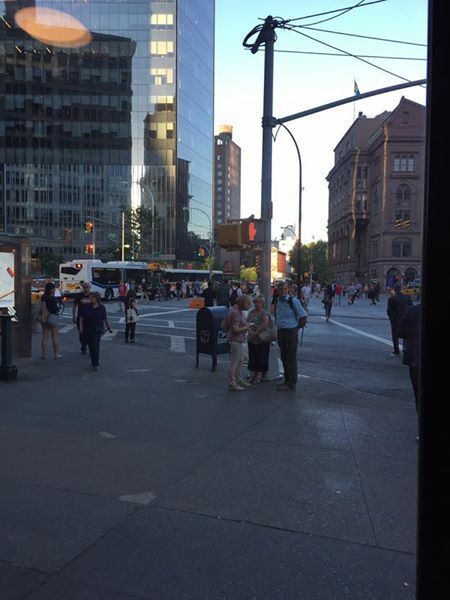 The Astor Place Starbucks..
>Nathan Breedlove – the place has changed so much in the past ten years. spent many a night in this place. 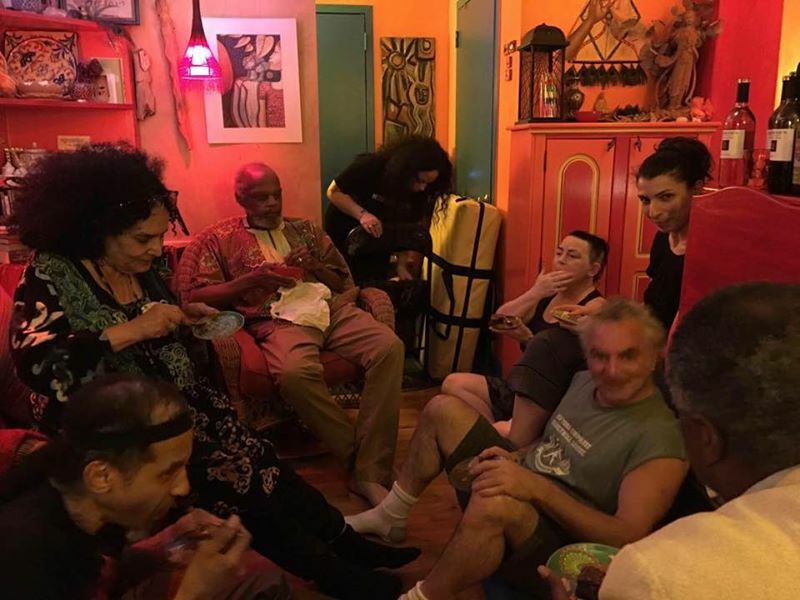 Hanging and sitting-in with the legends. >Jack LongYou should write your memoirs, Nathan. 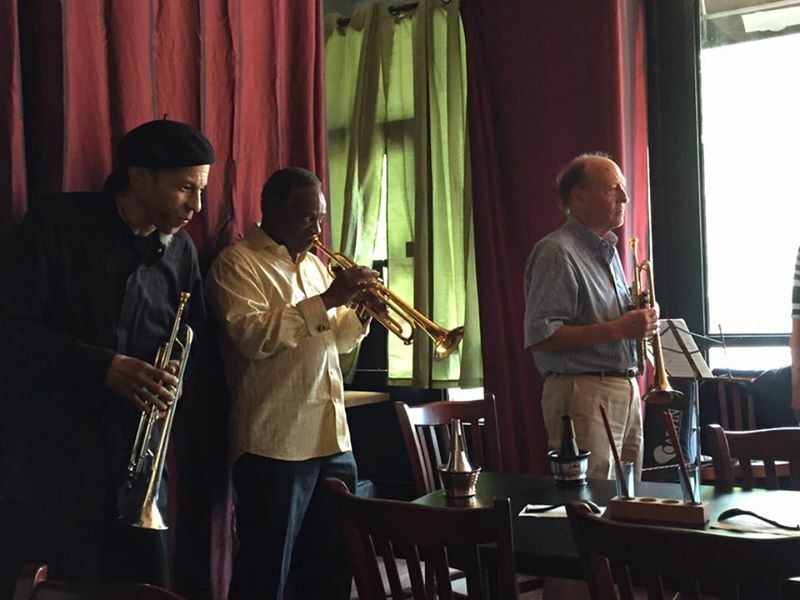 days one of Stan Getz’ close friends interrupted and joined our lament session. It was a special moment. I introduced Hadley to the spot and one night he sat in. 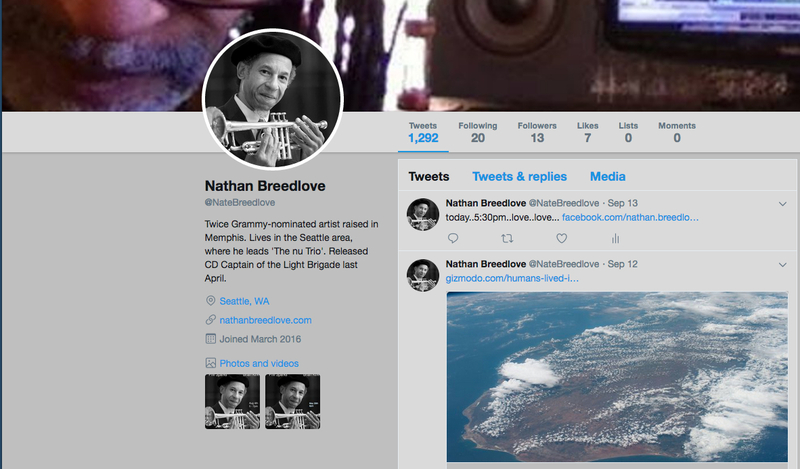 >Nathan Breedlove I have to wait on a couple more to make the transition first. all hanging and listening to Kenny…great joint. 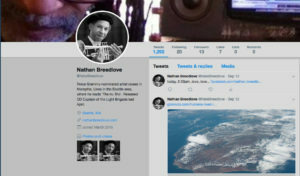 >Nathan Breedlove – those were the days. I was supposed to go see Barry Harris today. 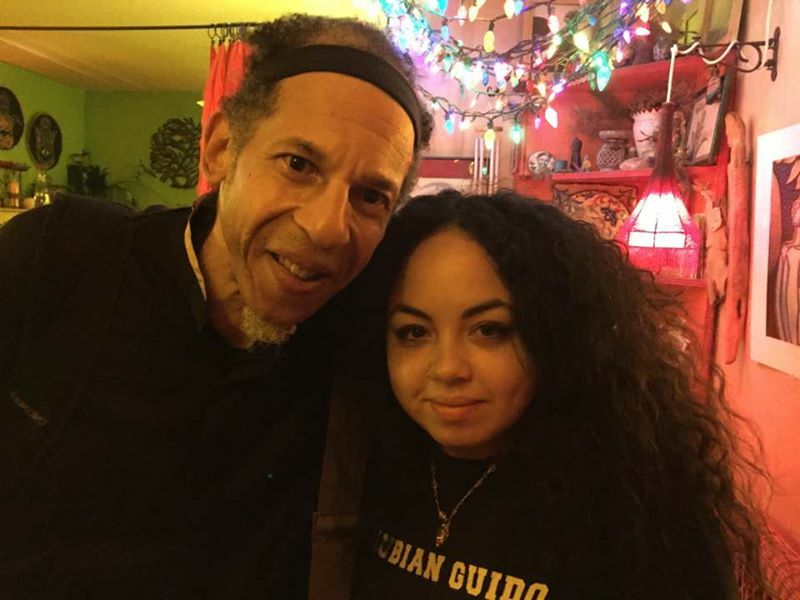 >Nashira Priester – That Kenny Kirkland collapse do you know what it was from? Paris and New York. They performed Ornithology together at the 11th Street Lounge. Nathan Breedlove and Jemeel Moondoc. 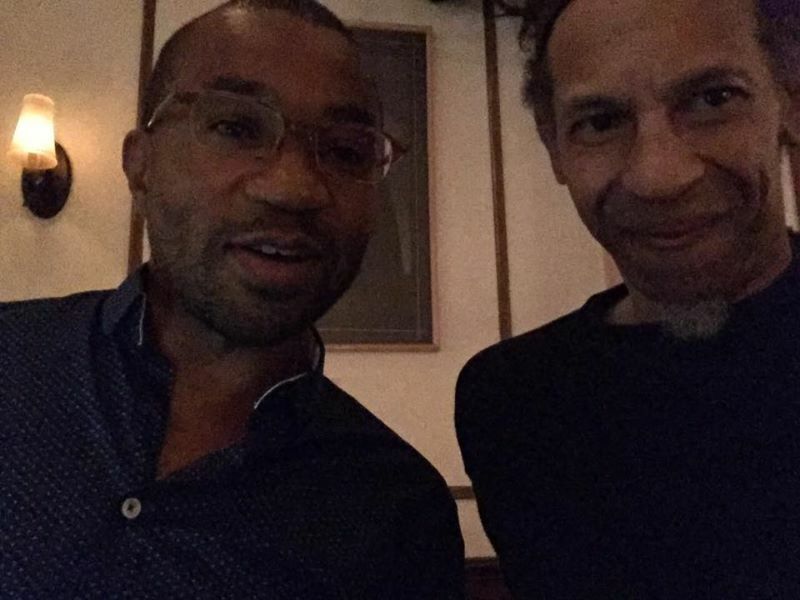 Jemeel is a prolific composer and heir apparent to Ornette Coleman. 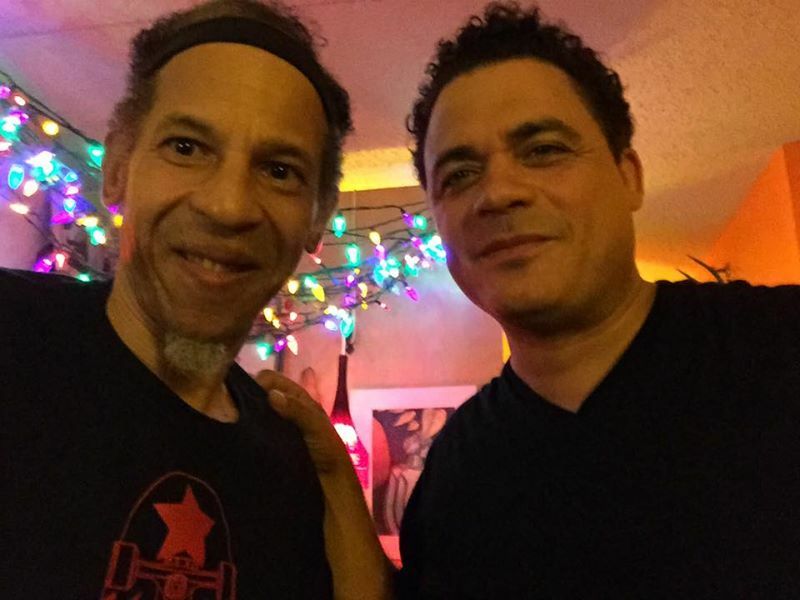 The two of us have been partners playing together for 25 years. 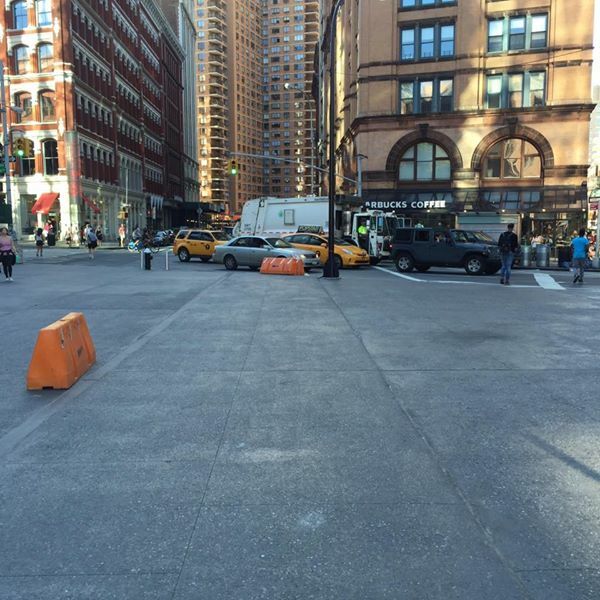 The Cube in Astor Place..is gone. No room for art..
My old home away from home. I had a room here with Evelyn Blakey from summer 1989-1993.
him everyday too. He got a triple life sentence. baddest drummers. Haven’t seen each other since we played together in Portugal, 2003. 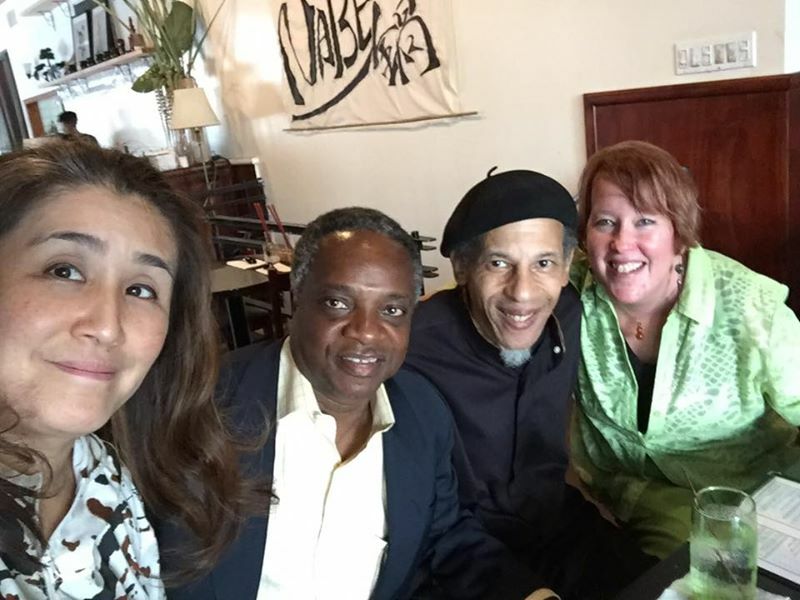 Nabuko Jazz, James Zollar, Nathan Breedlove and his friend Margaret Michniewicz. Nathan and Margaret Grimes at the Vision Festival. Dear friends for over twenty years..
spot introduced to him by Evelyn Blakey. 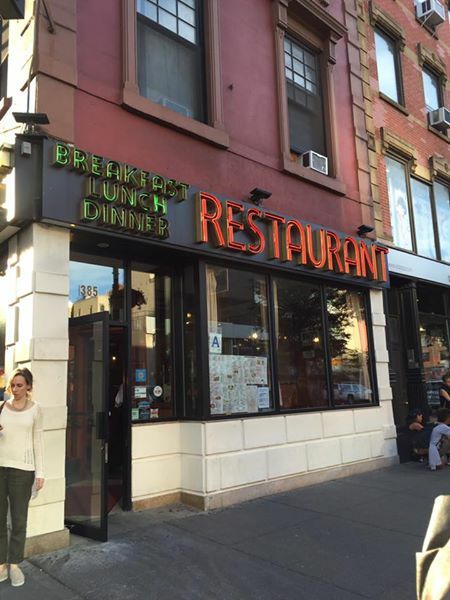 We used to eat here, a lot..
>Baba Andrew Lamb – Yeah Brother ! >Mra Oma – AS TIME GOES BY!!!! changed even the place I went to quite often. SAD !!! >Nathan Breedlove – amen. Like invasion of the body snatchers..
anyway. 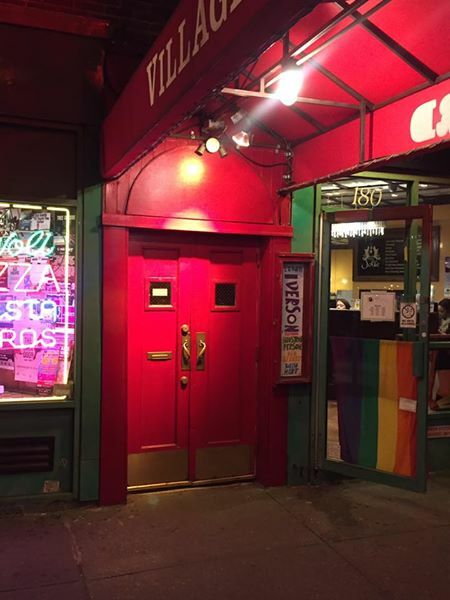 There were supper clubs up and down Ventura Blvd…no more! 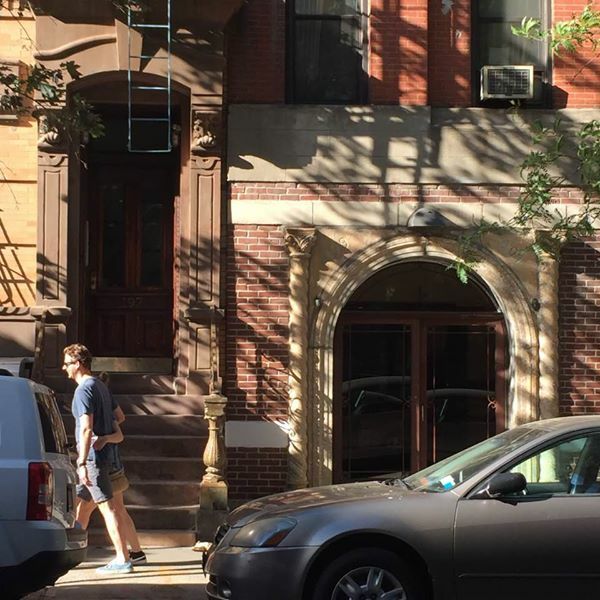 >Marlene Damon – I moved from NY years ago and can’t imagine it minus the lower east side! Sad!? 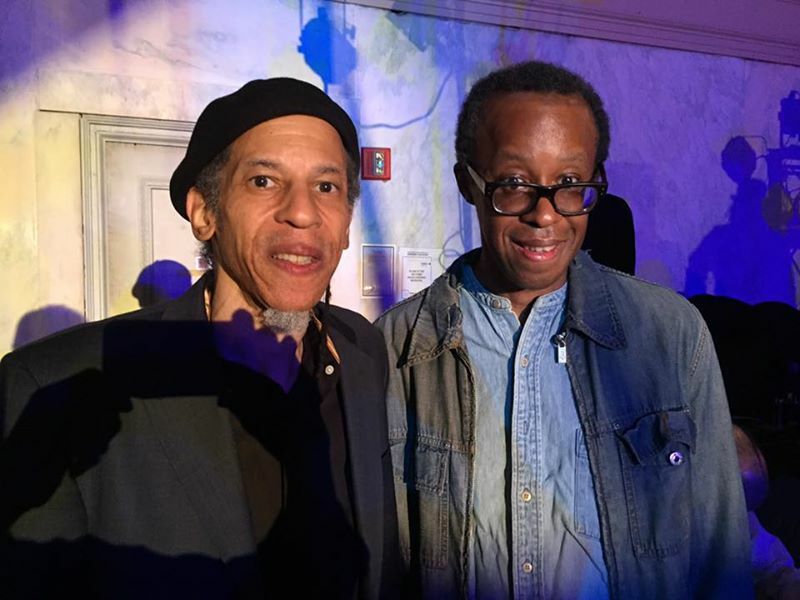 dismantling the bricks one by one..I desperately need management, which is the main reason I’m here..
Nathan Breedlove and Matthew Shipp – after the concert. Nathan at the LIRR – stress of the night..waiting on the LIRR. 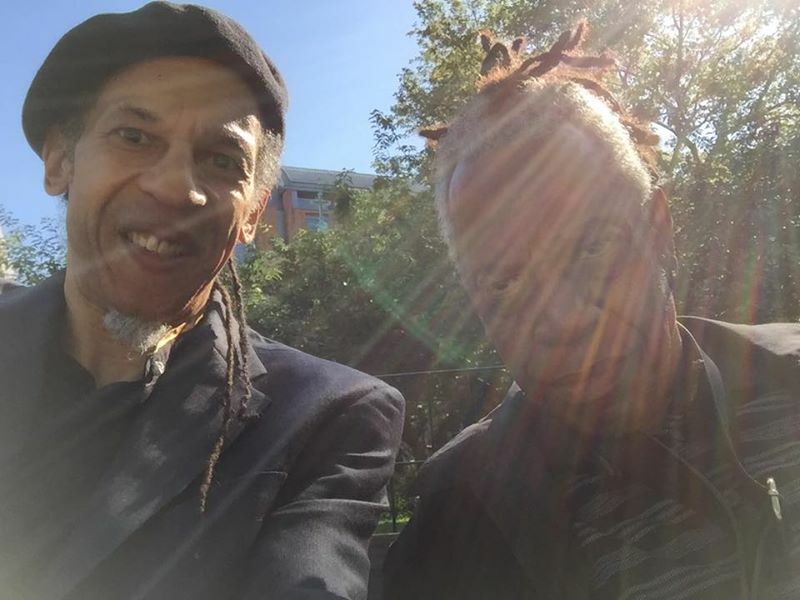 Nathan and Jemeel Moondoc – hanging in Washington Square Park before the festival begins. My room with a view, in Little Neck at Paul and Jennifer’s house. From the New York Times music listings for this upcoming week. 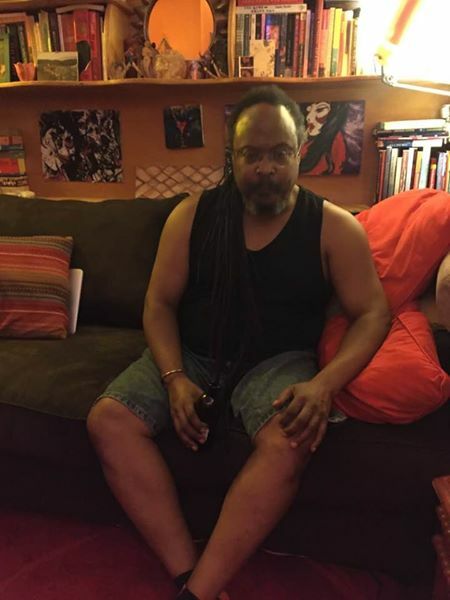 Nathan Breedlove is a member of Jemeel Moondoc’s Cosmic Nicklodean Quintet and peforms at 8pm on June 9th. Here’s a list of cats who cussed me out and told me to got to Hell!!! 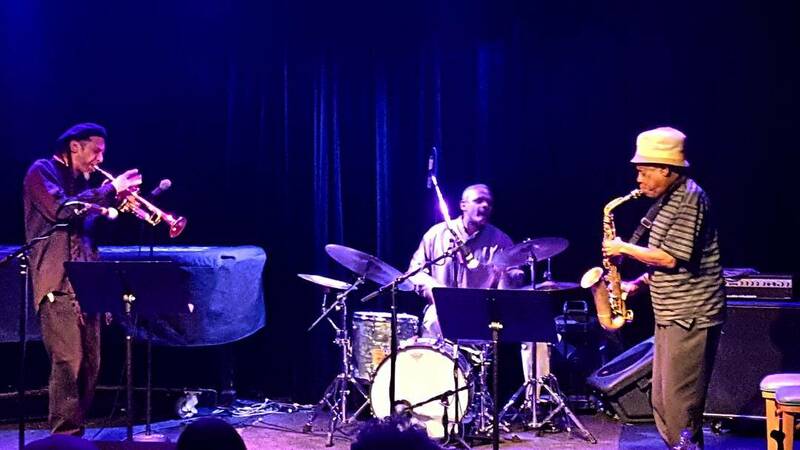 And then here’s a list of Cats I’d love to chat with…..
Nathan Breedlove and The nu Trio’s CD Release Party at the Royal Room in Seattle was a smashing success! 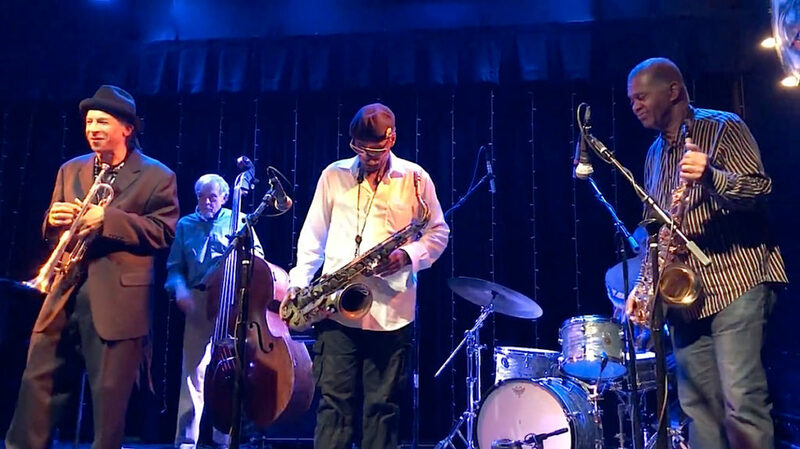 More videos on the video page..
Nathan Breedlove tearing it up with Brian Kirk and Nathan Breedlove • Phil Sparks • Brian Kirk – The nu Trio! 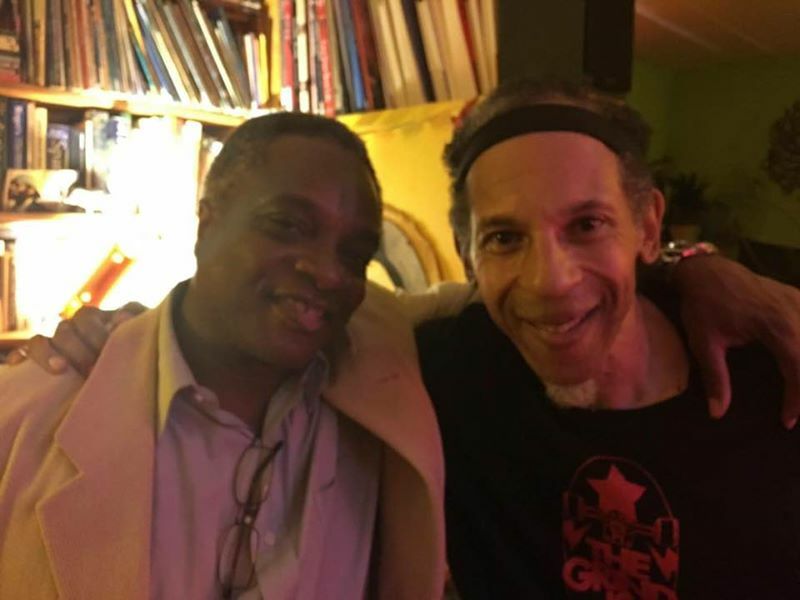 Blessed journey to my brethren King Bravo and Lord Tanamo, both closely associated with the Skatalites. Tanamo was a founding member. Hadley Caliman and I were closest of friends. When I was in NYC Hadley came out east to visit a few times. One of those excursions we even shared a bed together(feet to face) at Evelyn Blakey’s crib. The last time we hung together, I had rented a room in Brooklyn for a month so that we could record. 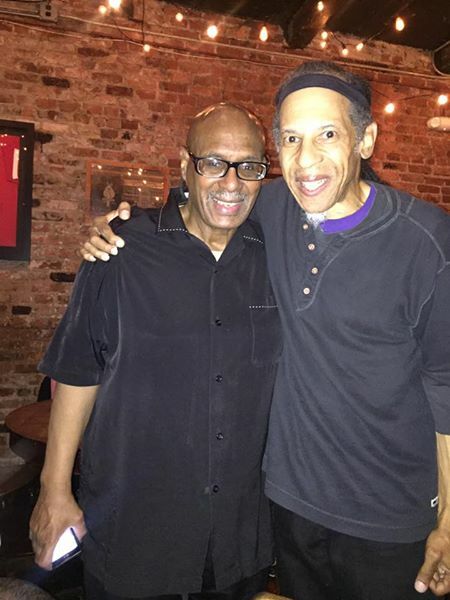 That’s when we recorded together for the last time with John Hicks, Curtis Lundy and Nasheet Waits(unreleased). On the last trip Hadley related to me his entire life story. About his day(s) picking cotton with his mother in Idabel and a funny story about how his mother ended one of her ‘relationships’. The man was sleeping and wouldn’t get up so she instructed Hadley and the other kids to each grab an arm and his legs. She calmly went to the fireplace and grabbed one of those old fashioned irons that you heated up in the fire, told the children to hold him, and boinked him(Hadley’s word) on the head with it. The pointed end. End of relationship…and then the story about how his father came from LA and kidnapped him. His mother came from Oklahoma and kidnapped him back! Or the story about his first amorous relationship as a kid, with Stymie’s little sister…and he got caught. And his first real relationship with a woman…there were both strung out and she suggested that he break into this joint and steal some checks, which he did. They hurriedly left LA and rode a bus to Ohio where her folks were. She was the niece of Count Basie and her father was a lieutenant or something in the police department. When he found out his daughter was involved in a crime and was strung out too, he gave Hadley two choices. 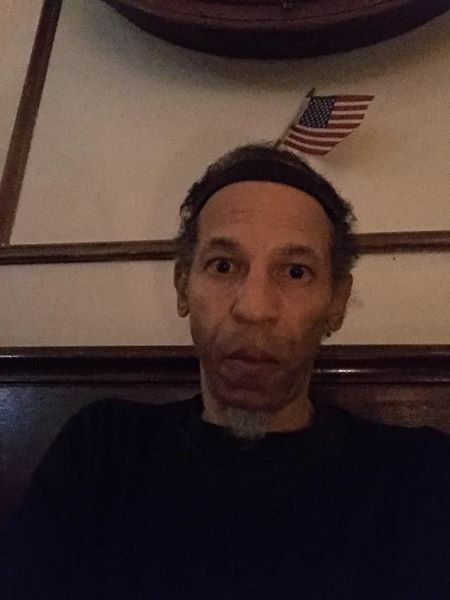 Either go back to LA or stay there and deal with him. After arriving back in Cali, Hadley was in a big room with a bunch of convicts being sentenced. Dexter was in there too. The judge said he was going to send some of them to this country club like prison and the rest to San Quentin. Hadley said when the judge got to him, he was the only one sent to San Quentin, a most notorious prison. This interview was conducted a few months before Hadley’s passing. 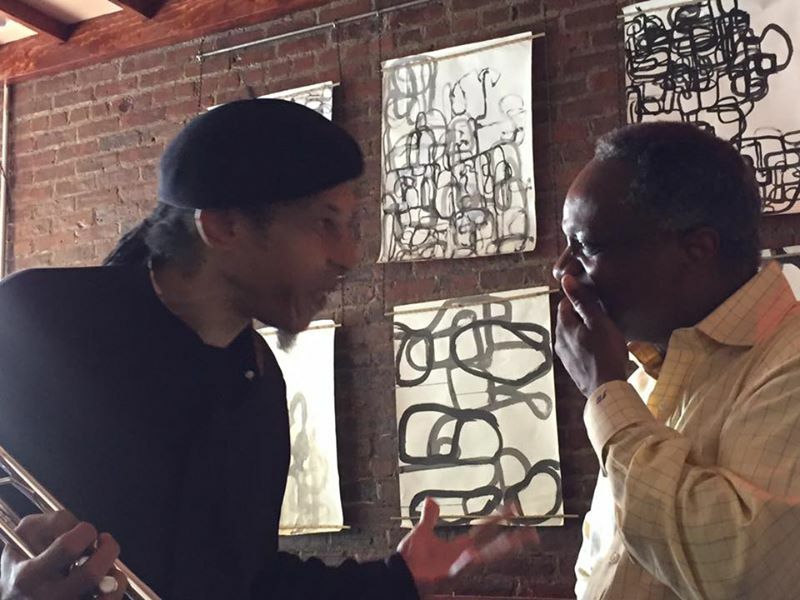 Reggie Goings conducted the interview and Paul Toliver recorded it. My 1996 Skatalite interview with Terri Gross at NPR, is now back online again. Nica Rothschild and Thelonious Monk at New York’s Five Spot jazz club in 1964. In the face of her family’s disapproval, she provided support to musicians both prominent – among them Charlie Parker, Sonny Rollins, Charles Mingus and Art Blakey – and obscure. The one with whom her name became inextricably linked, however, was Thelonious Monk. 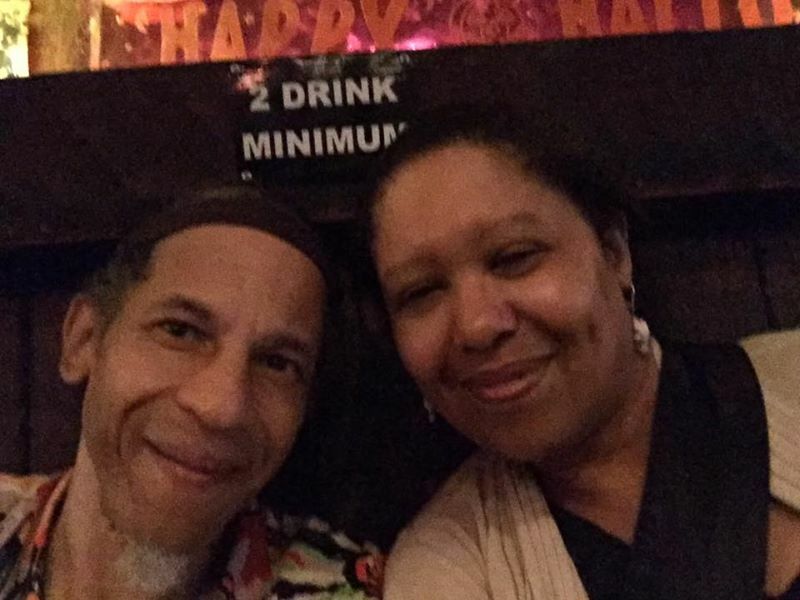 She fell in love with the music of the high priest of bebop in 1952, when she heard a recording of his classic composition Round Midnight, and two years later – when he was 34 and she was 40 – they began a relationship whose essence continues to defy analysis, and which ended only with his death. Nica, as the musicians knew her, was born in London in 1913, the youngest of the four children of the banker and entomologist Charles Rothschild. He named her, she said, after a rare butterfly that he had identified on a visit to the family estate of his Hungarian wife. In The Jazz Baroness, a new 75-minute documentary made by Nica’s great-niece Hannah Rothschild, we learn that the Pannonica is in fact a moth – “with yellow wings that look as if they’ve been dipped in Chateau Lafite,” Rothschild notes. Nica’s father, who suffered from depression, committed suicide when she was 12 and about to embark on an adolescence that to a Rothschild girl could only represent, as she would write, “a waiting room for marriage and motherhood”. A talented artist, at 18 she was studying art in Munich. In her early 20s, she learnt to fly, and in 1935 married Jules, a fellow aviator. They lived in a chateau in north-west France, where Nica gave birth to two children, Patrick and Janka. The outbreak of the second world war prompted the baron to head for Africa, where he planned to join Charles de Gaulle’s Free French army. 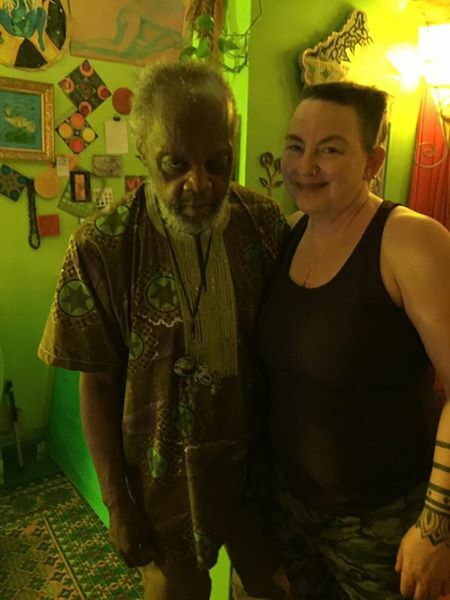 Nica left their children with friends in New York and joined her husband, serving as a cipher agent in Ghana and the Congo, and later in north Africa, Italy and France. When the war ended, the baron became a diplomat, first in Norway then in Mexico. They had three more children – Berit, Shaun and Kari – but, her granddaughter tells us, “Nica had trouble adapting to the demands of life as an ambassador’s wife”, and in 1952 the couple separated. Nica moved to New York; in 1953, Jules became France’s ambassador to the US and Canada. Jules was given custody of the three youngest children, although Berit and Kari would later spend time living with Nica. She was not, it seems, a negligent mother, but her priorities lay elsewhere, mostly with Monk, who wrote angular, abrupt melodies that were often dissonant but sometimes glowed with a brusque tenderness. A tall, imposing figure, he wore funny hats, spoke little (at least to reporters) and often rose from the piano stool to execute a strange lumbering dance. He already had a wife, to whom he dedicated Crepuscule with Nellie, the loveliest of his ballads. 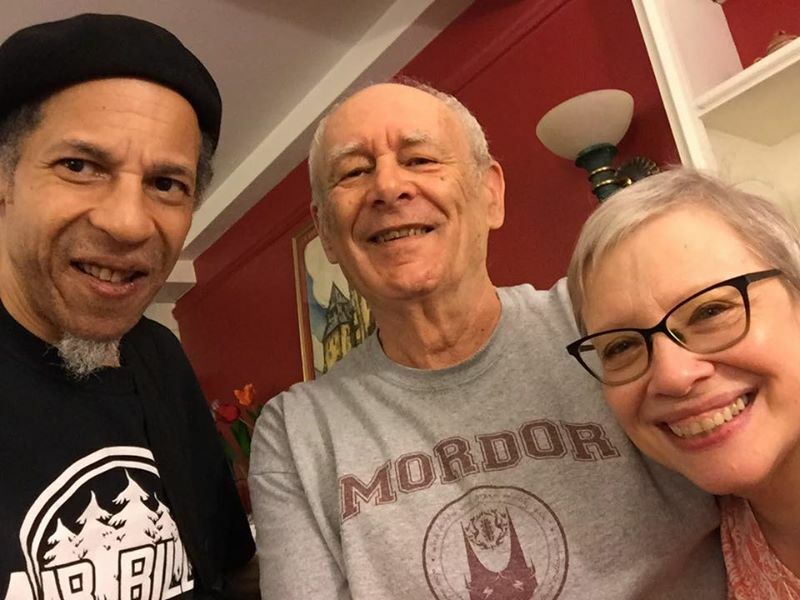 Somehow Monk, Nellie and Nica formed a ménage whose primary purpose was to sustain the great composer and bandleader’s ability to function in the face of problems that would probably be diagnosed today as the consequence of bipolar disorder. “Nellie needed Nica to help her cope with Monk’s mental instability,” says an interviewee in the film. The question of what Nica needed is rather harder to answer, but she certainly responded to the puzzle of Monk’s music. “She got it,” the pianist’s son, Thelonious Jr, tells Hannah Rothschild. “He loved her for that.” The pair became a familiar sight in New York clubs, with her Bentley parked at the kerb outside. But the spectacle of a white woman consorting with a black man in the 1950s was enough to provoke unpleasant incidents. 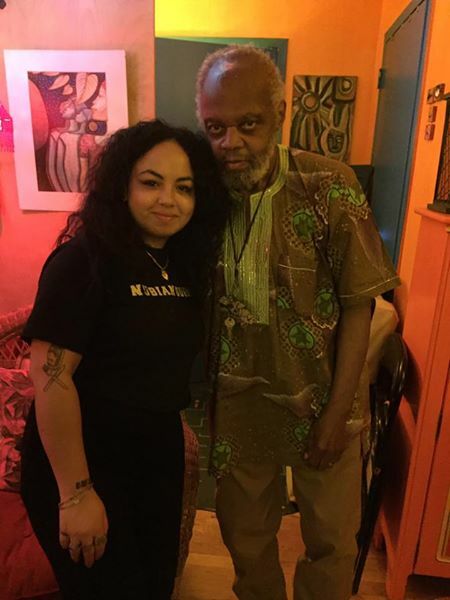 She was driving Monk and his saxophonist, Charlie Rouse, to a gig in Wilmington, Delaware, when, during a brief stop, a policeman searched the Bentley and found a small amount of marijuana in the boot. 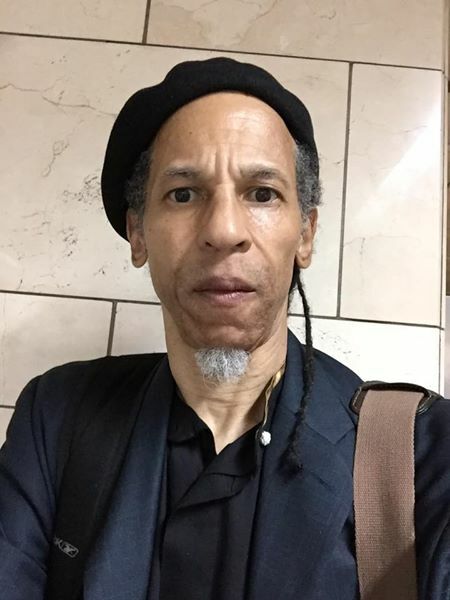 Knowing that a conviction for the musicians would mean the loss of the police permits that allowed them to perform in New York’s nightclubs, Nica took the rap, spent a night in the cells and received a three-year jail sentence, which was eventually overturned. Tired of being invited to move on by hotel managers who did not like the idea of jazz musicians trooping in and out of her apartment, eventually Nica bought a house (a modernist assembly of battleship-grey cubes originally built for the film director Josef von Sternberg) in New Jersey, with a view of the Manhattan skyline across the Hudson river. 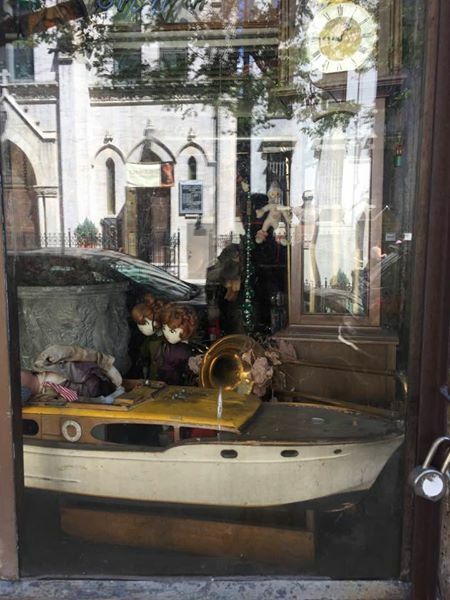 There she installed the Steinway piano she had bought for Monk, along with her cats – more than 300 of them. Monk hated the cats, but in 1973 he and Nellie moved in with Nica. His health deteriorating, he emerged for only a handful of appearances, the last of them in 1976. He died in 1982, aged 64. Six years later, Nica, by then 75 years old, did not survive a triple-bypass operation. Her generosity, however, did not die with her. The house, owned by her heirs, has been occupied for the past 20 years by Barry Harris, another pianist and loyal friend. Her five children are scattered around the world: Patrick deals in mineral fossils from bases in the Philippines and France, Janka lives in Israel, Berit is a printmaker in New York, Shaun is a banker in Paris, and Kari is a landscape painter in Scotland. Their father died in Spain in 1995. When Rothschild began the project, she was hoping the story of her great-aunt would “show me a different way to live my life”, and the film is at times a very personal one, leaving no doubt of the difficulties she experienced in persuading her family to overcome their reluctance to discuss the life of a woman who refused to be deterred by their disapproval. There was no such problem with the musicians, whom Rothschild recently described, introducing a screening in London, as “the most dignified, humane and articulate people I have met in 20 years of making documentaries”. 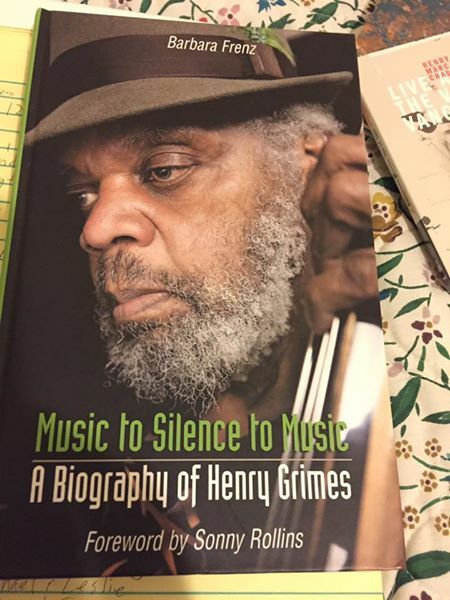 Here, then, is the answer for those wondering why the discography of postwar jazz is studded with a single exotic name, in a catalogue of compositions that includes not just Monk’s own Pannonica but, from other pens, Nica’s Dream, Nica’s Tempo, Nica Steps Out, Blues for Nica and a dozen others. 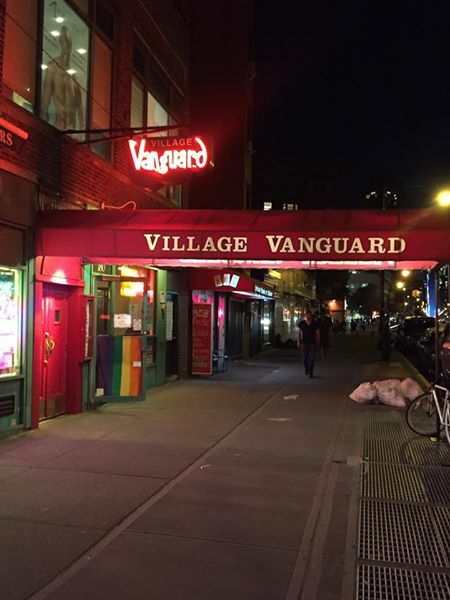 For a generation of jazz musicians, it was a way of repaying their most unlikely patron. 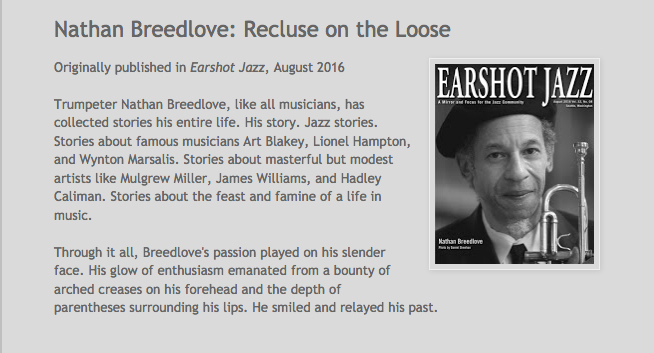 •The Jazz Baroness will be shown on the BBC’s Storyville series next year. Three Wishes: An Intimate Look at Jazz Greats, a collection of Nica’s Polaroids edited by her granddaughter Nadine de Koenigswarter, is published by Abrams, priced £9.99. 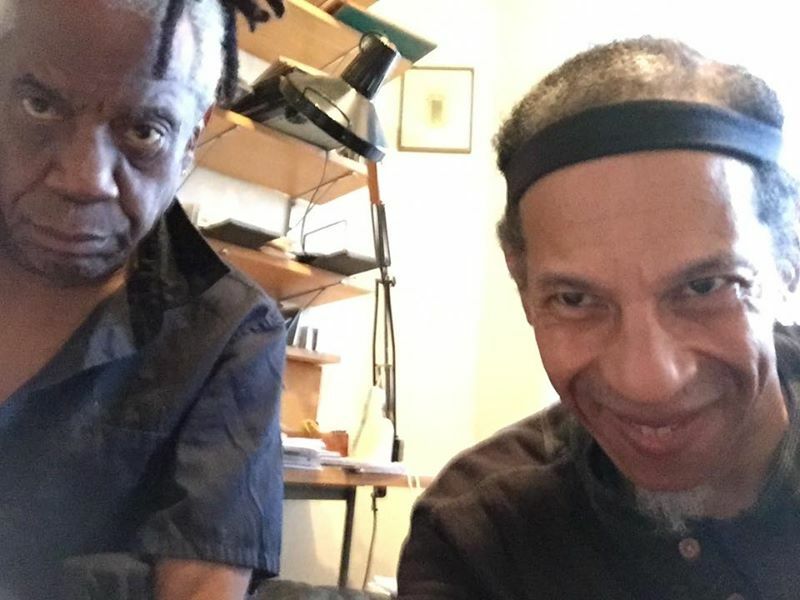 A new recording that I am involved with, along with Lester ‘Ska’ Sterling, the last living member of the Skatalites. Please check the new album by Big Ska Band, “Revival”, available now at iTunes. Beautifully preserved Canaanite figurine could be of fertility goddess or depiction of a real woman, say archaeologists. Lionel Hampton, the jazz vibraphonist, had a great sense of music as a continuously transforming event: His body of work keeps you on alert in the intensified, energetic moment. This picture, taken in 1985 by the Times photographer Marilynn K. Yee — but buried in the Times archives until now — perfectly captures Hampton (with drumsticks), midbeat on drums, the instrument of his early career. 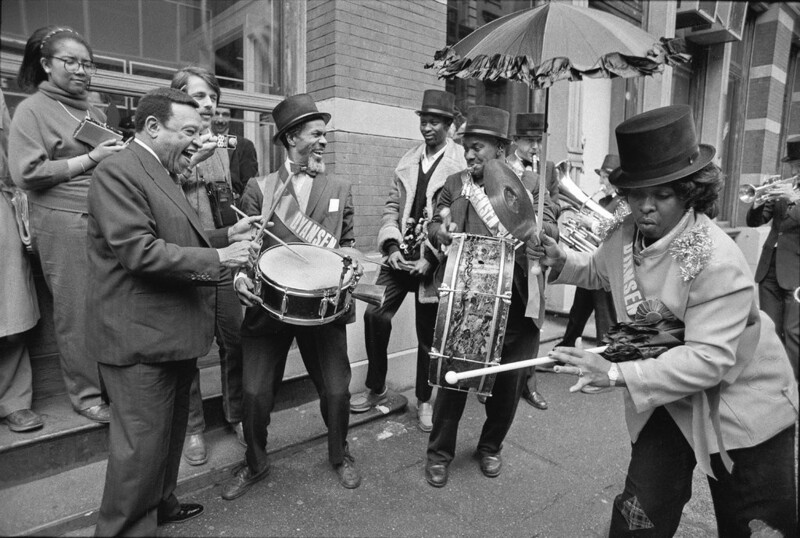 He had just joined a New Orleans-style parade in New York, celebrating an art opening of jazz-related works at the Dyansen Gallery in SoHo. His smile suggests he’s right at home, thrilled by the spontaneous spectacle. 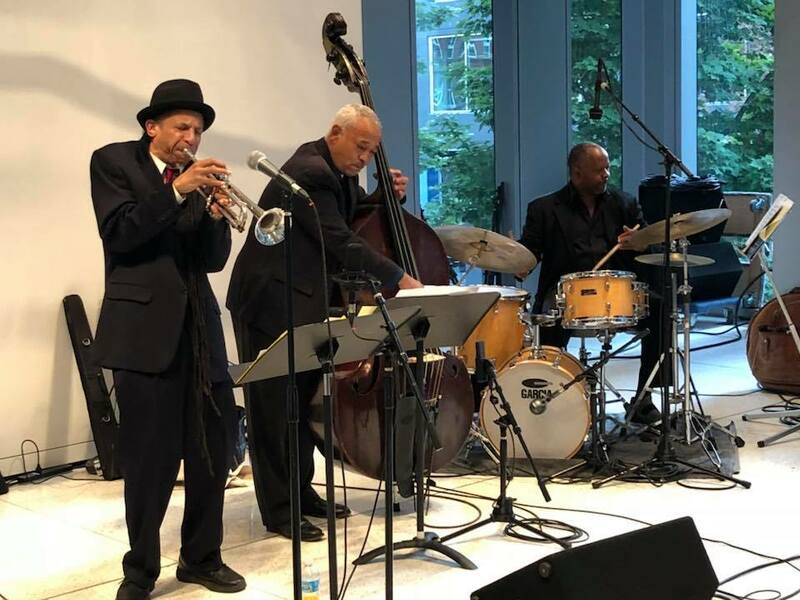 But the march — which started at Columbus Circle, went east to 57th Street and Fifth Avenue, then restarted in SoHo near the gallery after the musicians took a bus downtown — didn’t quite fit with our article, which previewed “a new and star-studded jazz festival” at South Street Seaport. So instead of this vibrant image with Hampton, who would be playing on the festival’s first night, we ran a portrait of his face. 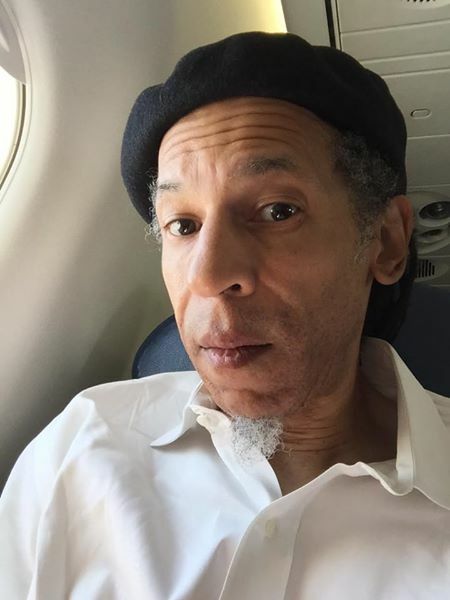 He later moved to Kenosha, Wis., and then to Chicago, and in the early days of his professional career he moved to Los Angeles to play drums in jazz bands, including Les Hite’s. Louis Armstrong used the Hite band on a trip out West and persuaded Hampton to play vibraphone; Hampton went on to become one of the pre-eminent soloists on the instrument. During the late 1930s, Hampton was also a star in one of the first high-profile racially integrated bands, Benny Goodman’s quartet, alongside Goodman, Teddy Wilson and Gene Krupa. Their records from back then remain powerful: impeccable, organized, propulsive. And yet here was Hampton making some of the most generous and confident American music of the 20th century. Some of what he did soon afterward, with his own bands, was rhythm and blues prefiguring rock ’n’ roll; “Flying Home,” in 1942, with a driving saxophone solo by Illinois Jacquet, became one of the great commercial breakthroughs made by a jazz musician. Hampton became an ambassador, bringing jazz far afield, and played “Flying Home” at Harry S. Truman’s presidential inauguration in 1949, in a program with Lena Horne and the operatic soprano Dorothy Maynor. And as Armstrong did for him, Hampton helped elevate other important musicians in their early years, including Dinah Washington and Quincy Jones. He also lifted others in smaller ways, creating music scholarships at universities and helping to build low-income housing. All that good will reverberated back to him in ways big and small. At the very least, it meant that a band of jazz marchers in 1985 could rely on him for unannounced percussion. It also meant that 17 years later, he would be the one honored by another New Orleans-style parade held in New York, after his death. Wynton Marsalis and the Gully Low Jazz Band led a crowd of mourners and fans toward Riverside Church, where luminaries gathered for his funeral. The speakers included Illinois Jacquet; the Rev. Calvin O. Butts III; Representative Charles B. Rangel; and the elder George Bush. 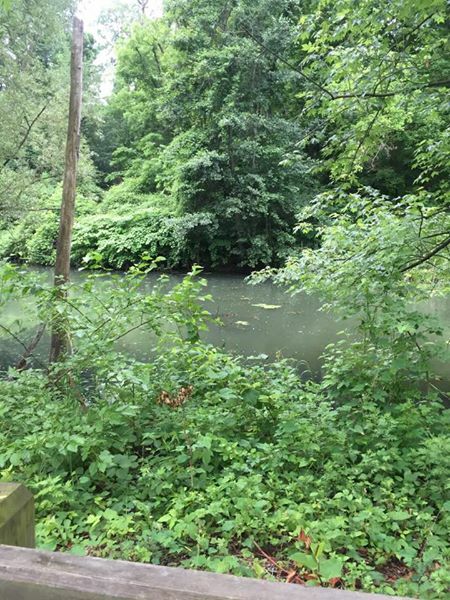 Nathan Breedlove shared Linda Lee Caliman’s photo. 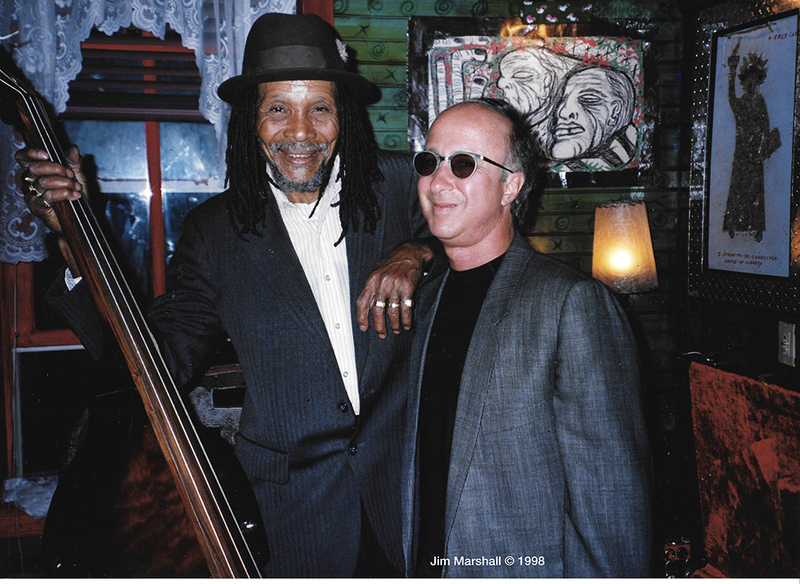 the legendary bassist of the Skatalites…the one and only..Lloyd Brevett…with Paul Shaffer at the House of Blues opening in Los Angeles…photo by Jim Marshall..
Lloyd Brevett OD (1 August 1931 – 3 May 2012) was a Jamaican double bassist, songwriter, and a founding member of The Skatalites. 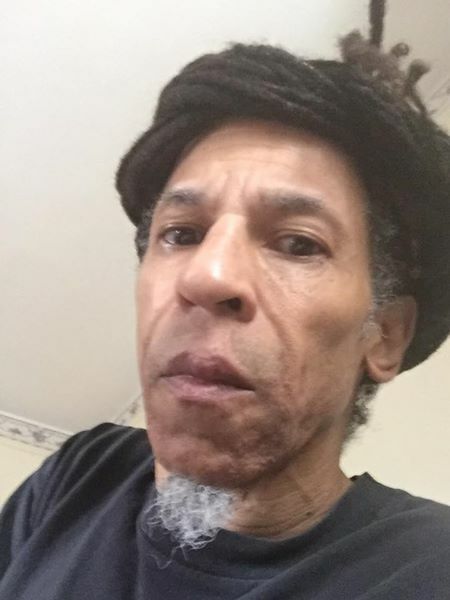 He was a rastafarian, and a brother of The Melodians member, Tony Brevett. I’ve been going through the digital archives for most of the day to select photos for my new website. What a way to get distracted, and now the whole day is gone. Time to enter the woodshed. This is a hip hop/jazz project that I was involved with briefly in the early nineties with producer, Floyd Fisher. Floyd wrote it for Miles Davis but his people turned it down. He decided to do it as a tribute to Miles and auditioned eight trumpet players before he got to me. He said all the other cats just played right over his music and that I was the first one to actually listen(horn players have a tendency to do that..haha). It made the major label rounds with great response, but never made it all the way through the label hurdles, as this was a little bit before the acid jazz scene really took off..
my pops in Korea. He was in three wars. WWII, Korea and Vietman. the sand clock…a close friend it is..reminds me to take breaks.. I Require Art with Mohamed Gharieb. Lyonel Feininger (American, worked in Germany; Expressionism; 1871–1956): Carnival in Arcueil, 1911. Oil on canvas, 41-1/4 x 37-3/4 inches (104.8 x 95.9 cm). Scientists say it could have been a matter of culture. 2nd in Montreux, Switzerland International competition two years before. Nathan Breedlove with Jim Spake and 8 others. Trevor Wyatt from Island Records…finishing up the final mix for Ball of Fire. Bill Smith, Nathan Breedlove and Trevor Wyatt(Island Records) at Sony Studio. so many variables and with such a delicate balance..we are such novices when it comes to understanding our planet and her mechanisms designed to maintain climate stability, ensuring habitable zones for our continued survival ..
prehistory…the unraveling of..all roots lead to Sumer…12,ooo year old artifact. Nathan Breedlove shared 10000 BC Göbekli tepe‘s photo. Bone collections found in a 9,000-year old village in Shkārat Msaied suggest the dead were dismembered and moved around a lot – maybe to make sure they stayed dead. I’ve been often described as the ‘under recorded’ Breedlove. I won’t go into the reasons but I do have three master recordings of my music in the basement. Maybe someday they will see the light of day. Here is a tune that I recorded with Hadley Caliman, John Hicks, Curtis Lundy and Nasheet Waits, entitled ‘Don’t Smash the Sausages’. This is tune dedicated to Hadley Caliman and I think only three people know the story behind it. This happens to be one of John Hicks very last recordings. Anyways…this track is but a rough mix and I offer it to you with love, my friends..love..love…. 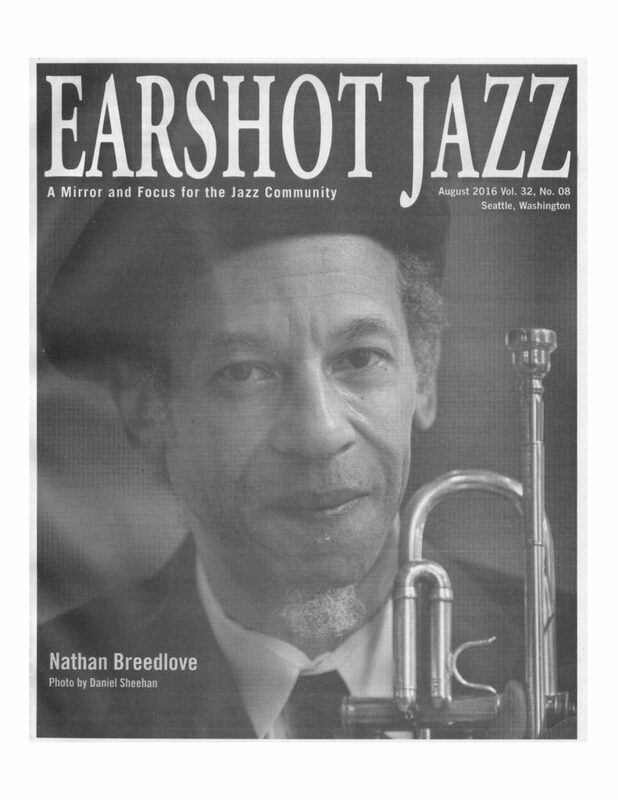 This is an unreleased recording of the Nathan Breedlove Quintet featuring Hadley Caliman (s), John Hicks (p), Curtis Lundy (b) and Nasheet Waits (d). Recorded with Hadley Caliman, John Hicks, Curtis Lundy and Nasheet Waits, entitled ‘Don’t Smash the Sausages’. This tune is dedicated to Hadley Caliman and I think only three people know the story behind it. This happens to be one of John Hicks very last recordings. Anyways…this track is but a rough mix, my friends..love..love….